Dr. Walter Willet is an epidemiologist who commenced exploring the connection between nutrition and health in the 1970’s. He realized that there was a lot of dietary advice available, but it was not supported by scientific research. 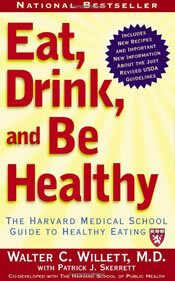 Eat, Drink and Be Healthy is the result of many years of investigation by Willet and his colleagues and is intended to help the general public to break through the confusion regarding what is a healthy diet. Willet does not approve of the USDA Food Guide Pyramid that is widely promoted as a tool to assist people in creating a healthy dietary intake. He says that it fails to serve its purpose of providing clarity regarding dietary choices and that many of the pyramid’s recommendations of are a major contributor to the current epidemic of obesity and unnecessary early deaths. The USDA pyramid advises us to consume 6-11 servings of carbohydrates daily however it fails to distinguish between healthy and unhealthy forms. White bread, white rice and potato are placed in the same category as whole grains and legumes. The pyramid also advises limiting the intake of fats without identifying the difference between essential fats and unhealthy trans fats. In response Willet offers his own version of the diet pyramid that addresses these issues. He then goes on to explain healthy eating in detail concerning the different categories of foods including carbohydrates, fats, protein, fruit, vegetables, and beverages. Although this is not a weight loss diet, or even a diet to overcome specific diseases, Willet advises dieters that weight control is the most important diet related health factor. Willet questions the BMI values and is of the opinion that the current upper ranges are too high and as such he advises the majority of individuals to aim for the lower ranges of recommendations for a healthy body weight. Whole grains, vegetables, fruits, and plant oils (olive, canola, soy, peanut, soy and sunflower) are at the foundation of the pyramid and these foods are to be included in most meals. The next level includes nuts and legumes which are to be consumed one to three times daily. Above this are fish, poultry, and eggs which are allowed up to twice daily. At the top of the pyramid on the smallest levels are dairy products, red meat, butter, and refined carbohydrates which are discouraged and are to be limited to two serves daily. The pyramid also includes recommendations for moderate intake of alcohol and the use of a multivitamin supplement daily. To reduce calories to 1600 dieters are advised to omit the whole-wheat toast, fruit spread and pumpernickel roll and to replace the fruit crisp with a fresh peach. Try these low Calorie recipes. Daily physical activity is placed at the base of the pyramid to emphasize its importance for health and weight control via improving insulin and glucose metabolism. Watch some exercise suggestions here. Eat, Drink and Be Healthy retails at $16.99. Based on comprehensive scientific research. Not extreme and does not eliminate food groups. Emphasizes the intake of fruit and vegetables with nine serves daily (not including potatoes) including a variety of types and colors to maximize nutritional phytochemicals. Explains science behind nutrition in a practical and easy to understand way. Explains why diet studies often provide contradictory opinions as well as the limitations of scientific studies. Emphasizes the importance of maintaining ideal body weight for improved health and reduced risk of chronic illness. Emphasizes the inclusion of good fats in the diet such as fish oil, nuts, and avocado that reduce the harmful LDL cholesterol as well as the risk of irregular heartbeats and blood clots. Includes recipes and meal plans. Provides tips for increasing whole grain intake. Very general approach to health that may not adequately address individual needs. Does not distinguish between the health effects of different vegetable oils and as such does not address the issue of the importance of balancing omega 3 and omega 6 fats. Willet’s ideas are sensible and up to date and his recommendations of daily exercise and maintaining ideal weight is good advice. However, this may be difficult to achieve without more precise guidelines for most dieters. There still appears to be an excessive emphasis on grains and Willet does not adequately address the issue of the proper balance of fats in the diet, but Willet’s advice is certainly an improvement on the current USDA pyramid.